This is the second installment of our overviews of the world's most important oil producing regions. We provide these updates to share with investors our insights on today's highly dynamic global energy markets and to highlight strategic deployment opportunities for our AOT technology in these high-output areas. South America is the fourth largest continent (6,890,000 square miles) and is rich in natural resources which include gold, silver, copper, iron ore, tin, natural gas and oil. Collectively, the nations of South America produce some 6,000,000 barrels of oil daily and several of these producers have emerged as important exporters to the United States and other global markets. Although the peoples and nations of this part of the Western Hemisphere are often referred to as Latin America, our worldview is better informed by geology and the hydrocarbons underfoot and subsea, rather than by language and culture. At a later date we will be providing a separate regional update on Mexico, currently the 10th largest producer in the world. We believe Mexico represents an exceptional market opportunity for us as it is on the brink of massive new upstream production. After 75 years of state control, our neighbor to the south is auctioning off access to its most desirable deep water production blocks in the Gulf. Global energy powerhouses such as Shell, Chevron, ExxonMobil, British BP, French Total SA, Spanish Repsol, Norwegian Statoil and Mexican Pemex are expected to bid on the drilling rights which will likely yield 90,000 barrels per day according to Mexican officials. A subcontinent of the Americas, South America consists of twelve sovereign states, plus French Guiana and the Falkland Islands, bordered by the Pacific Ocean, the Atlantic Ocean, and the Caribbean Sea. Among these nations, oil production is highest in Brazil, Venezuela, Argentina, Colombia and Ecuador. Known reserves in South America make up roughly 20 percent of the world's provable underground and subsea oil deposits. The greatest concentrations of oil and natural gas on the continent are found in the Orinoco Belt and Maracaibo Basin, both in Venezuela, and the area adjacent to El Tigre, a 75-mile, north-south trending fault in Argentina. Two significant basins located in deep water offshore Brazil's southeast coast provide that nation with close to 3,000,000 barrels of daily output, placing it first among South American countries and ninth in the world. The wealth brought by the wide range of export commodities found throughout the continent has resulted in both prosperity and economic stability as well as corruption, strife and political upheaval. Most of the energy resources in South America have historically been controlled entirely by state-owned petroleum entities. Emblematic of the nationalized nature of the oil and gas industry in this region is the history of Petrobras. Created in 1953 when the Brazilian government granted Petróleo Brasileiro S.A. (Petrobras) a legal monopoly over all its hydrocarbon resources, the company has grown substantially beyond its primary production regions of the Recôncavo and Carmópolis oil fields and offshore Campos and Santos Basins. Today Petrobras is ranked 58th on the Fortune Global 500 List and owns or controls oil and gas assets in 16 countries which include Africa, North America, South America, Europe, and Asia. However, this semi-public multinational corporation has endured periods of mismanagement and corruption and is currently $128 billion in debt. A highly publicized $3 billion corruption scandal in 2014 rocked its leadership and entangled several highly placed government officials, the fallout of which continues to destabilize Brazil's leadership. The second largest producer of hydrocarbons on the continent, Venezuela (ranked 12th globally), nationalized its oil industry in 1975, creating Petroleos de Venezuela S.A. (PDVSA). Ecuador's Petroecuador is also state-owned, created from the original national petroleum company Corporación Estatal Petrolera Ecuatoriana (CEPE) formed in 1972. Colombia's national oil company, Empresa Colombiana de Petróleos, was chartered in 1948 and subsequently launched in 1951 to supersede the Tropical Oil Co., the nation's first producer. In 2003, the Colombian government restructured it as Ecopetrol S.A., a public stock-holding corporation. On April 1, 2013 the pipeline and other transportation-related assets of Ecopetrol were transferred to Cenit (Cenit-Transporte y Logistica de Hidrocarburos S.A.S.) a wholly owned subsidiary. Fortunately, after generations of heavy-handed nationalization of hydrocarbon resources, a wave of investment-friendly privatization is sweeping through South America. Many of these governments are now opening up access to their resources by partnering with foreign energy companies and auctioning off mineral rights to their largest deposits of oil and gas. Venezuela's PDVSA has entered into joint ventures with Chevron, China National Petroleum Corporation, Repsol and others to initiate several major projects that will require over $100 billion in capitalization. As one of the most liberalized of the formerly completely state-owned energy entities, Bogotá-based Ecopetrol is now intently pursuing foreign capital and joint venture partners. Earlier this year the company announced Ronda Campos 2016, an open auction of 20 of its most prized production assets, kicking off its five-year strategy for "creating sustainable value and more efficient operation of assets" in an effort to generate maximum profitability for its shareholders. Producing over 60% of its national crude oil output and owner of Reficar, its biggest refinery, Ecopetrol is the largest company in Colombia one of the top 50 largest oil companies in the world. However, the nation's 5,200 miles of primary and secondary crude oil of pipelines are woefully inadequate to transport its daily output of roughly 1 million barrels per day. An overreliance on tanker trucks to transport crude has been a costly drag on margins and resulted in reduced competitiveness, especially in today's supply surplus global market. To reach the Ministry of Mines and Energy's goal of a national pipeline capacity of 1.4 million bpd, Cenit plans to invest approximately $4 billion (USD) by 2019. In addition to optimizing the performance of existing pipelines, takeaway capacity will be expanded through ambitious construction projects in each of Colombia's primary crude oil production regions. Following an initial presentation to a major Columbian oil pipeline company's leadership, we are currently in the process of discussing the potential deployment of customized AOT systems in support of their plans to favorably affect the flow of crude oil through existing lines and deliver overall better efficiencies of their sprawling infrastructure. The opportunity for improving the performance of their operations with strategically placed AOT systems provides an ideal application of our patented technology. The bulk of crude produced in Colombia ranges from heavy to heavy sour to intermediate, most of it requiring diluents such as naphtha to encourage acceptable flow rates. 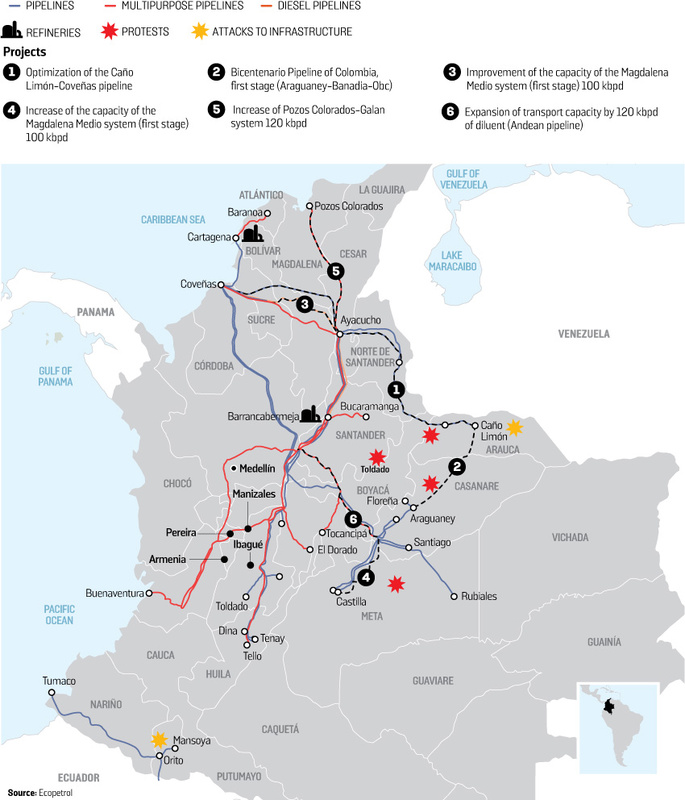 Among the heaviest grade of Colombian production are Castilla Blend from the plains region which is transported by pipeline to Coveñas port in the Gulf of Morrosquillo on the Atlantic Coast; Magdalena Blend, a heavy sour crude produced in the Magdalena Medio basin; and Vasconia crude, produced by mixing output form the plains region and the Upper Magdalena. Due to this Columbian company's status as a vertically-integrated energy entity, controlling vast aspects of exploration and production, transportation and refining, they present us with the potential to use our industrial hardware in a variety of configurations to deliver greater efficiencies throughout their operations. In pursuit of additional opportunities within the Colombian energy sector, we have established an agreement with Finamco SA, an asset-based lender active in high-growth and emerging markets in Columbia. Working with Finamco management we expect to continue to benefit from introductions to senior management at several of the other 12 private sector crude oil producers active in this market, beyond the one that they have already provided. As in other pending overseas AOT projects, our goal is ensuring the most favorable terms possible for our shareholders and maximum return on investment for the customer. In our next Regional Update we will discuss the Chinese and Russian energy industry and our collaborative efforts to adapt AOT technology to subsea infrastructure in the North Sea and other offshore applications. We invite you to contact us anytime with your questions, comments or suggestions at [email protected] or [email protected]. For QS Energy news and articles concerning the energy industry, follow us on Twitter and LinkedIn. For further information about QS Energy please read our SEC filings at www.sec.gov, and, in particular, the risk factor sections of those filings. Some of the statements in this release may constitute forward-looking statements under federal securities laws. Please visit the following link for our complete cautionary forward-looking statement: http://www.qsenergy.com/site-info/disclaimer.